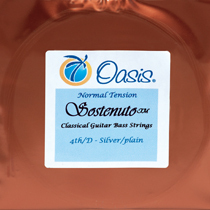 Sostenuto™ bass strings were developed by Oasis® for the discerning classical guitarist who, above all, desires a lyrical and powerful sound, with prolonged sustain. The strings settle in quickly and have superior durability. 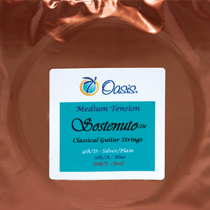 Sostenuto™ bass strings come in three different tensions: normal, medium and high. 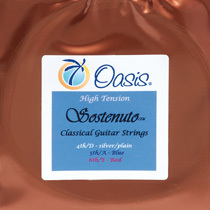 Strings are available in sets (4th, 5th and 6th string), and come wrapped in tarnish resistant poly bags. Sostenuto™ bass strings are included with all GPX+™, Titanium™ and Regency™ complete sets. $3.95 shipping on any quantity of strings.